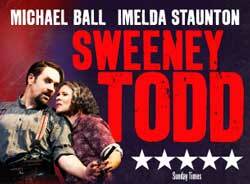 Michael Ball and Imelda Staunton are playing Sweeney Todd and Mrs Lovett in Sondheim's musical Sweeney Todd which is due to start previews at the Adelphi Theatre on 10th March and open on the 20th. Michael Ball has regrown his beard in readiness for the role and he and Imelda Staunton have just been interviewed on the Jonathan Ross Show. One piece of breaking news is that Robert Burt who is playing Pirelli is away for a month during the run and comedian Jason Manford will be taking over his role. Manford won ITV's Born to Shine where celebrities put their new taught skills to the test in aid of Save the Children with his rendition of a Verdi aria. He has a good operatic voice and has always wanted to appear in a musical guesting on Alfie Boe's Bring Him Home tour earlier this year.